It’s fair to say I have a pretty long list of pet hates. Even just limiting it to the food and restaurant related ones would probably run into several pages, so I won’t share all of them just now, but will say that two of them that are right up there are ‘the majority of restaurant chains and the homogenised food they serve’ and ‘things that try too hard to be authentically from another country, particularly France’. You’d think, with that in mind, that French-style restaurant chain Côte Bistro would not be high on my agenda of places to eat, and it wasn’t for a long time until an enforced meal there for a work outing allowed me to realise that it’s actually rather good. I would say “it’s the exception that proves the rule” but that would invoke yet another one of my pet hate lists (see: ‘phrases and sayings that make no actual sense’). The Cardiff branch of Côte, which means ‘coast’ and is therefore rather apposite given its location, is a fairly regular haunt of ours for a casual lunch at the Bay when it’s not quite warm enough to eat al fresco. We decided to pop in there over the recent Bank Holiday weekend and enjoyed another good meal. The décor of Côte can best be described as Parisien café style, rather than traditional French bistro, but it’s been done in a charming and understated way – there are no pictures of clichéd French things, and no random French words emblazoned on every available surface (Café Rouge, I’m looking at you). The only downside for me is that it feels a little sparse – it’s bigger than the average French bistro, the tables are further apart, and it feels less intimate – but it’s still got a definite French touch to it. The menu has a similar feel: a lot of very traditional French dishes, but none of them too clichéd – for example it’s refreshing to see that the obligatory Moules do not feature, perhaps because they’re not in season, or perhaps because they acknowledge that it would be too difficult to offer consistently good mussels in every geographical location at all times of year – and I don’t believe I saw a croque monsieur either. Incidentally, I’m pretty sure that the chain has recently renamed itself from Côte Brasserie to Côte Bistro – I’d be quite interested to learn why! In addition to starters, mains and lighter options, there’s a range of ‘Plats Rapides’ – quick lunches, which I’ve partaken of a couple of times when on a working lunch, plus daily specials. 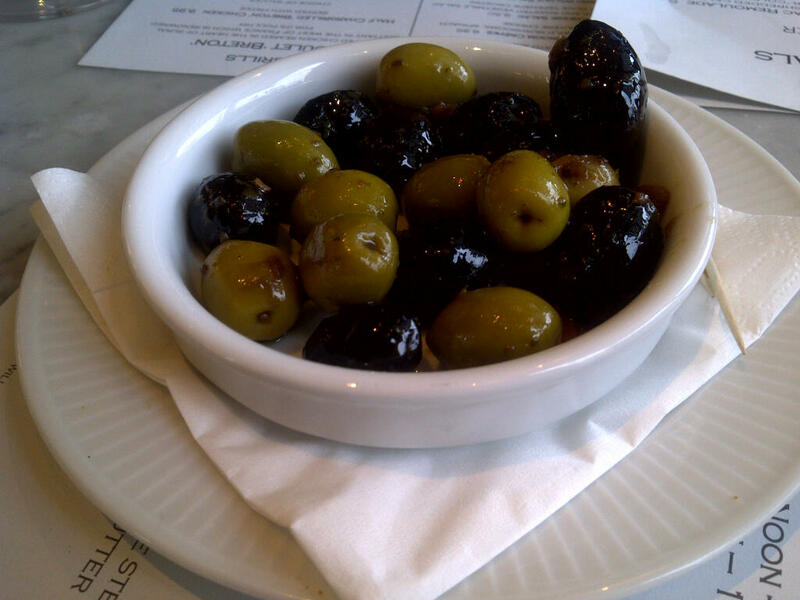 There’s a few ‘nibbles’ too, including Pissaladiere (no sniggering, please), and olives, of which we partook whilst deciding on what we wanted to eat. 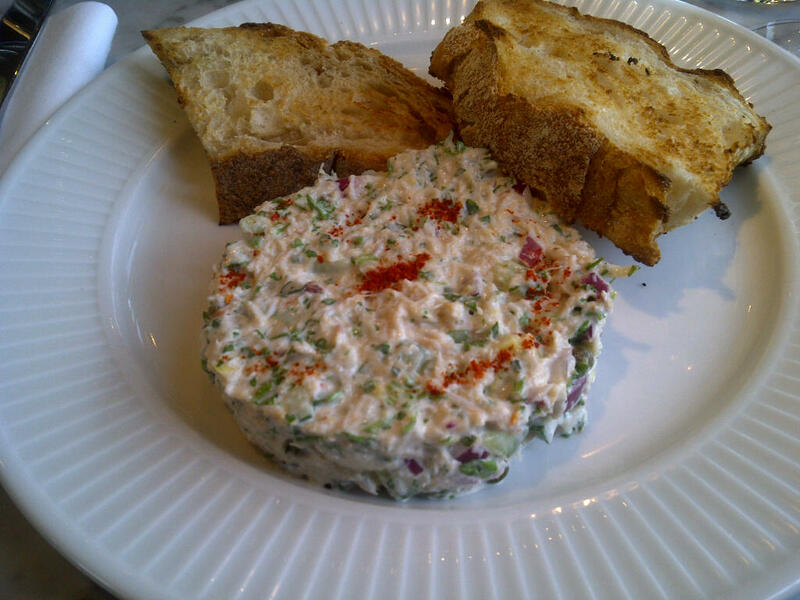 To start, I chose Crab Mayonnaise – which was flaked crab meat mixed with avocado, cucumber, capers, and tarragon, bound with a little mayonnaise and served with toasted sourdough bread. This was really good in both taste and texture, with lots of fresh flavours, and it worked well with the toast too. 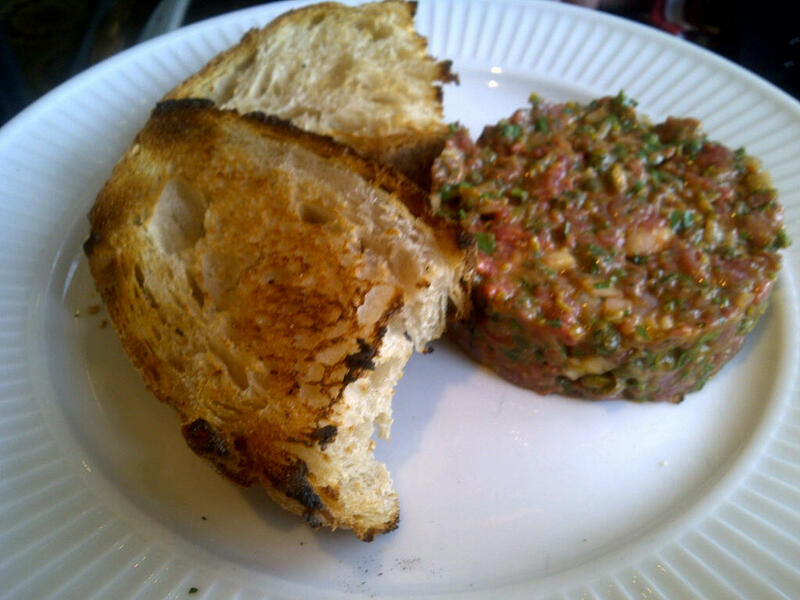 Mr W chose the classic French steak tartare. Raw steak is not to everyone’s liking, but I’m pleased to see it on the menu, as all too often, chains ‘dumb down’ the cuisine they’re trying to emulate, assuming that the average British diner will be put off. If it means that someone tries something new, then it can only be a good thing in my book. The dish looked as if it had been assembled using an identical blueprint to my own starter, but they both looked good! This tasted great too, well-seasoned and not too wet or sloppy – I’d say it was one of the best steak tartares I’ve tried in the UK, and better than some I’ve had in France too. It didn’t come with the customary raw egg yolk on top, but perhaps this is a step too far for the average British diner, particularly those who remember Edwina Currie’s biggest moment of fame that didn’t involve John Major (I think the two are equally stomach-churning in their own way, so we’ll move swiftly on as I don’t think either of them belong in a food review). 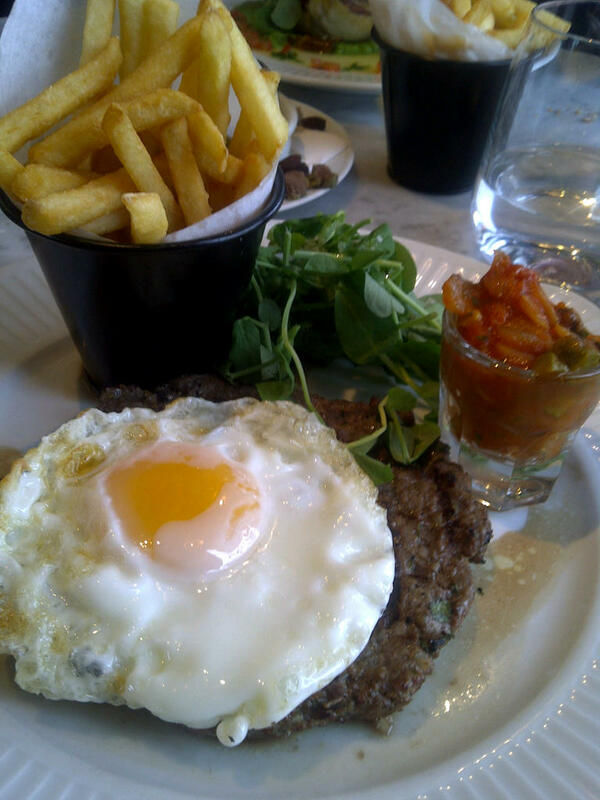 For my main, I went for a steak hache, and chose the ‘a cheval’ option, which meant it came topped with a fried egg. This was served with frites and a small pot of tomato relish. I was pleased to be asked how I wanted the steak hache cooked, as it probably resembles a hamburger more closely than anything else, and many restaurants, particularly chains, will not even contemplate the thought of cooking a hamburger to a diner’s liking. I had it medium rare, and it was definitely cooked right, but sadly I didn’t enjoy it as much as I thought I would – it was beaten out too thinly for my liking, so still tasted more well done than I would have preferred (perhaps the lesson is to ask for it less cooked than I normally would with a steak), was a bit over-seasoned for my palate and also didn’t seem a great fit with the fried egg, which had a nice runny yolk but was a tad on the greasy side. Mr W, on the other hand, loved the mouthful I gave him to try and then ended up polishing off what I left, so I think it was just a bad choice on my part! 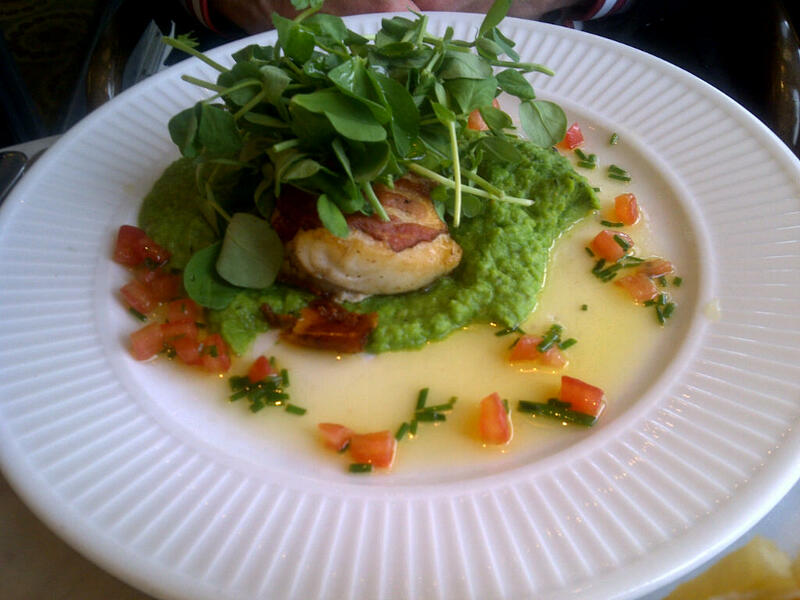 Mr W chose one of the specials: haddock wrapped in French bacon and served with a pea puree. This was delicious, the crispy, salty bacon working well with the texture of the haddock and complemented beautifully by the sweet pea puree. I was more than happy when we swapped plates towards the end of our meal! It was a beautifully presented dish, too, and the colours of the different components made it a very spring-like dish. It didn’t come with any potatoes, so we had an extra portion of frites too, which are worth mentioning as they were very good too, and I’m not normally a fan of thin cut chips unless they’re cooked really well. The fact they come served in a pot helps as they don’t go cold too quickly. 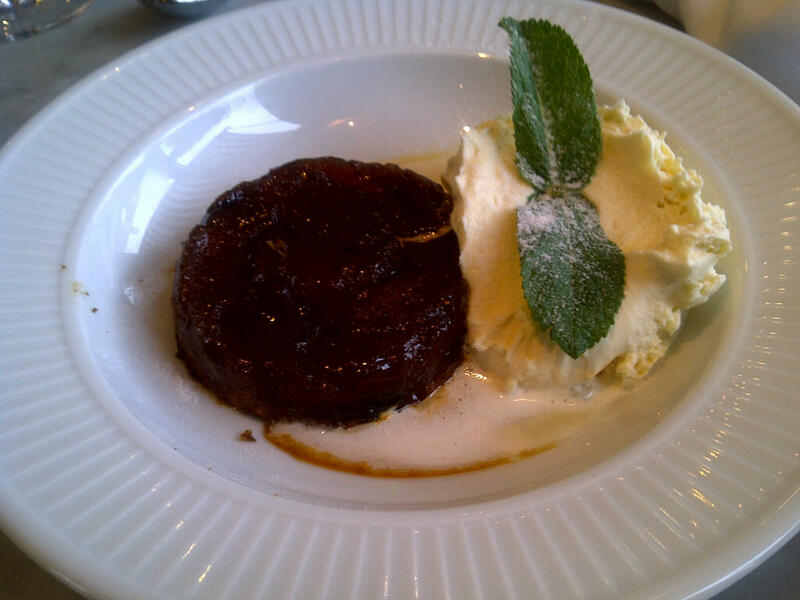 For pudding, we chose a tarte tatin which came served with Calvados cream. This was gorgeous! The tarte had a very rich caramel, and plenty of it, and the Calvados cream was wickedly indulgent but set the dish off so much better than a simple scoop of ice cream or dollop of crème fraiche would have done. I think I’d say this is probably the best pudding I’ve ever eaten in a restaurant chain. I’m a really big fan of Côte Bistro. They’ve managed to take the concept and individuality of the French bistro and somehow translate it into consistently good food on a more mass catered basis, without resorting to cliché or cutting corners. When the food is this good, there’s no need for obvious pictures of the Eiffel Tower or men with stripy shirts and strings of onions around their necks. You can easily forget that you’re eating in a chain, and the food is better than that in some of the independent restaurants at the Bay. The service was really good on our visit too – friendly and attentive, and knowledgeable about the food and the specials. Our bill for 2.5 courses each and a couple of glasses of wine each came to around £70. My only minor complaint was the addition of a hefty 12.5% ‘optional service charge’ to the bill. I’m not keen on the addition of these at the best of times, as I like to proactively reward good service where I think a reward is due, but even when the service is very good, I think 12.5% is too much unless the experience has been truly outstanding, but it wasn’t our waitress’s fault that it had been added to the bill. It’s probably the fault of my British reserve, but I therefore didn’t want to make her – or myself – feel awkward by asking for it to be removed, when she had in fact given us very good service. I’m not going to resort to a cliché of my own (having already done so by giving this review a title in French!) and recommend that you visit Côte next time you’re in the mood for ‘a taste of France’, but I will recommend that you visit if you just fancy some good, fresh, French-inspired food in pleasant surroundings. I don’t think you’ll be disappointed. Interested to read this – I ate there last weekend too and thought the food was pretty good, especially for a chain. The service was very good and the other thing I noticed was several diners eating tout and being well looked after – tres Parisien! That’s a very good point – we noticed this too, even on a weekend lunch time, which is probably a more unusual time to dine alone. One of my happiest memories is a long weekend I spent in Paris ‘seule’ and I had some fantastic meals and service in little cafes and bistros. Perhaps I should take a solo wander to Cote sometime!